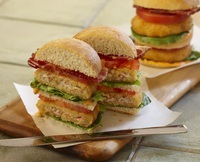 The King & Prince Seafood Gourmet Seafood Crab Cake offers a new twist on an American classic while providing exciting ways to expand your menu. With their hand-made appearance, irresistible flavor, versatility and value, the King & Prince Gourmet Seafood Cake products are guest-pleasing additions to any menu. From freezer to oven or freezer to flat-top, these 3 oz. Gourmet Seafood Cakes are specially formulated to accentuate the delicate, sweet taste of premium quality crab. Serve with your favorite complimentary saue. These cakes can also be grilled on the flat-top - and if lightly chopped after grilling, are great served as crab wraps.